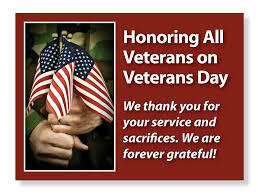 ·Veterans Day does not include an apostrophe but does include an “s” at the end of “veterans” because it is not a day that “belongs” to veterans, it is a day for honoring all veterans. Memorial Day is a day for remembering and honoring military personnel who died in the service of their country, particularly those who died in battle or as a result of wounds sustained in battle. Veterans Day is largely intended to thank LIVING veterans for their service, to acknowledge that their contributions to our national security are appreciated, and to underscore the fact that all those who served – not only those who died – have sacrificed and done their duty. “Armistice Day” was established in November, 1919, one year after the conclusion of WWI to commemorate the cessation of hostilities – an armistice – on the eleventh hour of the eleventh day of the eleventh month. In 1954, at the urging of veterans service organizations, Armistice Day became Veterans Day. Two websites with resources regarding veterans. Ken Pope publishes multiple pages of resources on his website. On Resources for Troops & Veterans, Families, & Clinicians, Dr. Pope states “I collected the following resources to make them more easily available to military troops and veterans, their families, and those who work with them.” These resources include 126 articles published between 2013-2016 on issues relevant to veterans and their family members. In addition, he links to 38 helping organizations and programs, plus 14 links to United States military organizations. Every year, many companies thank our veterans by offering free or discounted items or services to them. See http://militarybenefits.info/miscellaneous-discounts-veterans-day-deals-veterans/ or do a search to find additional offers. Please thank a veteran today!